I’m one of those people who likes to find a nice groove, and stick with it, no matter what it is I am doing. My mobile devices are certainly no exception. I already had a good set of apps and accessories from my original iPad, and I naturally expected to use a lot of the same stuff when I got my iPad 2. However, sometimes it’s good to shake things up a little bit, and a device like the iPad 2 does that. With its thinner size and integrated Smart Cover magnets, it caused me to change up some of what made perfect sense with the original. While I love the iPad 2’s on-screen keyboard, I do enough writing on the run that I find a hardware keyboard to be a necessity. 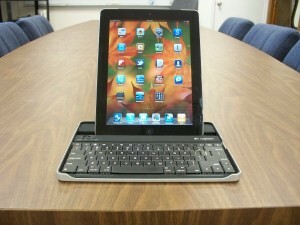 I have lately done the same re-evaluation with my iPad bluetooth keyboard that I have with the rest of my accessories. I had been using an Apple Bluetooth Keyboard, which is actually a very solid device. Unlike a lot of the cheaply made iPad 2 “keyboard cases” that have hit the market over the last year, the Apple device is a full-sized and durable, but still lightweight keyboard that works very well with the iPad. The main drawback with the Apple Bluetooth Keyboard has been the lack of an easy way to carry it with my iPad on the go. Even though it isn’t an all-in-one solution like most of the competition, I recently purchased the Incase Origami Workstation, and found it to be a really nice alternative. It is a thin and light cover that wraps around the keyboard while on the go, and then folds out into a very functional iPad stand that the keyboard stays securely clipped to. In other words, whether we’re talking about the original iPad, or the iPad 2, I had a pretty good keyboard solution already worked out. While I had little to no interest in most of the iPad keyboard case alternatives on the market, I had kept my eye on one- the ZaggMate. The original ZaggMate definitely caught my eye when it hit the market, with its unique design, and very positive reviews. Unfortunately, by the time it became widely available, I was already certain that I would be upgrading to the iPad 2. Considering its role as both keyboard and case, I figured that I had better wait until after upgrading to take a closer look. Having gotten an iPad 2 on launch day, I was eager to get my hands on the newest version of the ZaggMate for the iPad 2 so I could see how it stacks up with my current Apple Bluetooth Keyboard. The first thing that I noticed when I got my review unit was that it is no longer called the ZaggMate. 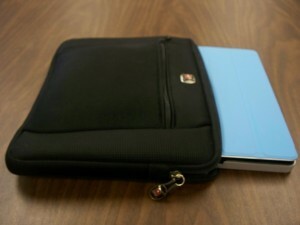 The current version is now known as the Logitech Keyboard Case for iPad 2 By Zagg. Wow, that’s quite a mouthful. The reason for the name change is a new partnership between Logitech and Zagg that has seen one of the largest and most respected brands in computer, mobile device, and electronics accessories pick up Zagg’s unique design to sell under their own brand. I spoke to Nate Nelson, the Public Relations Manager with Zagg, Inc, and he let me know that, other than size adaptations for the iPad 2, the Logitech Keyboard Case is otherwise the same as the original ZaggMate. Considering the popularity of the original, this certainly makes perfect sense. When I asked about his thoughts about the new relationship with Logitech, he seemed extremely pleased, saying that it was a huge positive to be partnered with a company with such a recognizable name and wide reach in the electronics world. This definitely sounds like good news to me, as I would expect to see this keyboard gain wider retail availability with a name like Logitech on the box. Whatever the current name is on the box, the hardware itself is very impressive. Considering the primary purpose of this device, let’s take a look at the keyboard, first. 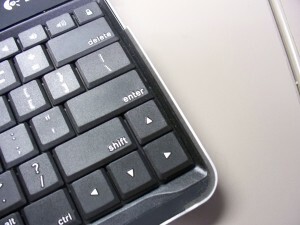 The keyboard is similar in size to what you would find on most 10″ netbook computers. This definitely took a little adjustment on my part, since I’ve gotten used to the full-sized Apple Bluetooth Keyboard and I have pretty large fingers. Despite this, once I got used to the Logitech Keyboard Case, I was able to type very quickly and accurately with it. As for the keys themselves, they are a bit recessed due to the dual-purpose design of the device. The keys sit below the rubber gasketed sides of the device, which serve to hold the iPad 2 in place when using the Keyboard Case as a case. The only potential issue here is that the sides curl around the right and left corners in front of the keys. I didn’t personally find that to be problem, as my hands naturally curled over them most of the time. Even when my the palms of my hands rested on them, it wasn’t a big deal to me, since the edges are not sharp. While this isn’t a problem for me, some user reviews have mentioned this as a negative, so give this some thought before you take the plunge. As far as the keyboard response, I found it to be really good. In fact, I think that helped me overcome the small size. The keys are solid-feeling plastic, where several other iPad keyboards have used softer, less responsive materials. Thanks to the higher quality materials, the Keyboard Case’s keys have a nice feedback and rebound, despite the fact that the keys are fairly flat to accommodate the iPad 2 in case mode. I also loved the fact that, other than a slight alteration of the arrow keys, the keyboard layout is exactly what you would normally expect. Sometimes manufacturers make concessions in this department for the sake of size, so I’m happy to see that Zagg was able to make this work. The last major feature of the keyboard, and it’s a big one, is the wide variety of dedicated shortcut keys. Above the row of number keys, you have shortcut buttons for the Home Screen, Spotlight Search, Slideshow, Virtual Keyboard on/off, Cut, Copy, Paste, Undo, Redo, Previous Track, Play/Pause, Next Track, Mute, Lower Volume, Raise Volume, and Lock. There is also an International Keyboard button in the bottom-left corner. These keys are a big addition, as far as I’m concerned, as Zagg actually showed up Apple’s own device in this department. The Apple Bluetooth Keyboard has many of these shortcuts, but most are done through key combinations, not dedicated keys. Also, Apple’s keyboard does not have keys for the Home Screen, Spotlight, or Lock. So, if having shortcut keys on your iPad keyboard is important, you should definitely give Logitech Keyboard Case a look. 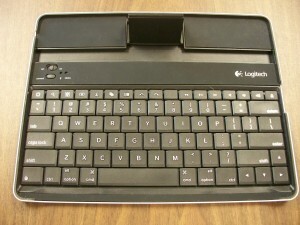 The Logitech Keyboard Case has a dedicated On/Off switch, Bluetooth connection button, and Charging and Status lights, all of which are recessed below a strip of rubber padding above the keyboard. The sliding two-position On/Off switch is a nice touch, as you can always tell whether the keyboard is powered on or not. This happens to be one of my few gripes with the Apple Keyboard, as it can be easy to accidentally turn it on and not realize it until you can’t pull up the iPad’s on-screen keyboard. The Connection button is only used when pairing, but again, it’s nice that it was included, as it insures that you don’t have to remember any shortcuts or key combination sequences to pair with your device. 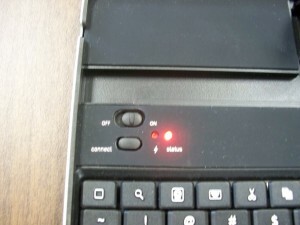 The Status light pulls triple duty, lighting red for four seconds when you power the keyboard on, flashing during Bluetooth pairing, and then flashing repeatedly when the battery is at or below 20%. 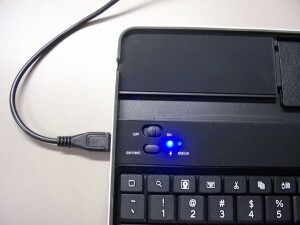 The keyboard’s Charging light flashes blue while it is charging, and goes off when charging is complete. While we are on the subject of charging, the Logitech Keyboard Case has a Lithium Polymer battery and it gets very impressive battery life. The included documentation states that the device should last for “several weeks” on a charge, and after my use, I would believe it. I typed this entire review, and more on this keyboard, and never had a battery warning. In fact, I haven’t charged it since I got it, except briefly to snap the photo included above. When the time to charge does come, there is a Micro USB cable included to do the honors. I was a little disappointed that there wasn’t a wall outlet adapter included, but that would bulk up the packaging, and those are pretty easy to come by if you are an Apple user. A valuable feature that helps to preserve the Keyboard Case’s battery life is the included Sleep Mode. For those times that you walk away from your keyboard with the switch turned On, it will time out after several minutes of inactivity. When it’s time to get back to work, just tap on a key to wake it back up and resume typing. We’ve covered the keyboard, so let’s take a look at what else the Logitech Keyboard Case has up its sleeve. First off, it has an integrated dock that is small and simple, but holds the iPad 2 securely in either portrait or landscape orientation. 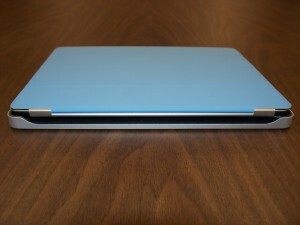 The case has a small, integrated stand made of hinged plastic that folds out, snaps securely, and holds the back of the iPad 2 at an ideal angle. 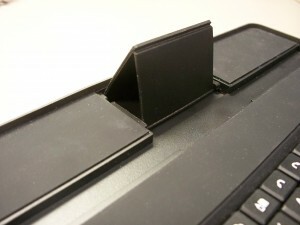 The front edge of the iPad 2 rests in a small groove behind the keyboard. All in all, the design of the dock works very well. If there is a drawback, it is the fact that the viewing angle is not adjustable. However, considering the quality of the keyboard, the compact size, and the fact that the only viewing angle available with the integrated stand is a good one, this isn’t a big issue at all. Also, bear in mind that since the Logitech Keyboard Case connects via Bluetooth, you don’t have to use the integrated dock. You can use any stand or dock you prefer, and the keyboard will function just the same. On the same note, because it is a Bluetooth device, the Keyboard Case can also be used with other iOS devices, or any device capable of integrating with a Bluetooth keyboard, as well. 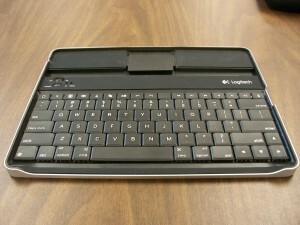 One of the most notable features of the Logitech Keyboard Case is how well it works in the lap. This is a very important feature where iPad keyboards are concerned. Many of the ones released for the original iPad were fully enclosed, folding soft cases, making them a poor fit for lap use on the go. While the aforementioned Incase Origami Workstation and Apple Bluetooth Keyboard are better than average in the lap, the Logitech Keyboard Case’s flat aluminum bottom easily makes it tops in this category. If you need to use your iPad 2 keyboard in your lap or in a small space like an airplane tray table, while on the go, you should definitely check this one out. While the keyboard is the main draw of this product, its unique multifunction design helps to separate it from the rest of the competition. While the majority of iPad keyboard cases have a folding clamshell design, which is inherently bigger due to the need for hinges and a way to hold the iPad at all times, the designers of the Logitech Keyboard Case found a simple, but effective way around this problem. By separating the keyboard function from the case function, they have slimmed the Keyboard Case down to make it the smallest combo device on the market. The way it works is incredibly simple. After you finish using the keyboard, you pick up your iPad 2 and fold the stand down flat, and then put your iPad 2 face down on the keyboard and press it until it seats. There are even cutouts for the dock connector and headphone jack that help you line things up correctly, and allow you to continue to charge and listen to tunes while your device is protected. The iPad is held securely in place, and the screen is completely protected. The recessed area in front of the keyboard keys performs double duty here, also allowing you an opening to get your fingers between the devices to remove your iPad 2 from the case. The only issue here is that, while your screen is very well protected, the back of the iPad 2 remains exposed. Considering that the screen and edges are so well protected, I didn’t find this to be a big problem, myself. In comparison with the very popular Apple Smart Covers, the Logitech Keyboard Case actually offers a great deal more protection. Whether this is acceptable to you will probably depend on how you use your iPad and where you are carrying it. With a closer look at the Keyboard Case, you can see the care that Zagg took when developing their original design. While I have already mentioned this in terms of the keyboard, the high quality materials also make a big difference in how the case works. 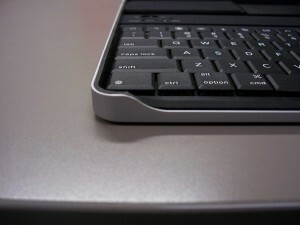 The backbone of the entire Logitech Keyboard Case is the aluminum base. Lightweight, but rigid, it provides the necessary stability and protection you need for both keyboard and case to function properly. It also maintains a feel that is consistent with the material used in the iPad, making this Keyboard Case a perfect fit with it. Zagg and Logitech also made a nice call by including four adhesive silicone feet for the bottom of the aluminum to the package. These can be placed wherever you choose, and serve to provide additional surface grip, as well as some measure of scratch protection. The last thing you want to worry about when you put your iPad in a case is having it pick up scratches from the case itself. This is a design concern for any metal case, but again, Zagg did an excellent job of mitigating these concerns. 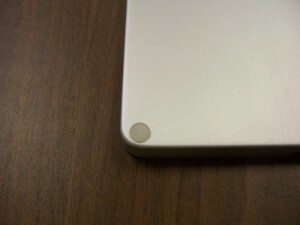 All of the aluminum edges that touch the iPad are completely covered with a form fitting rubber gasket. This material both protects the iPad, and gives it something to grip against when it is pushed down against the keyboard, which helps to hold it in the case securely. The screen of your iPad is also protected from harm, as it rests against rubber strips and gaskets, which are raised slightly above the keys of the keyboard. I personally use screen protectors for all of my electronic devices, and I would recommend using one with the Logitech Keyboard Case, as an extra layer of protection. This will just give you a little extra insurance to prevent scratching due to debris that might get between the keyboard or rubber surface and the iPad 2’s screen. Of course, Zagg itself is quite well known for their Invisible Shield line of screen and device covers, so finding one to handle the job shouldn’t be an issue. Speaking of Invisible Shield, Zagg also has a model specifically made to cover the aluminum surface of the Logitech Keyboard Case. So, if you choose to use a skin on your iPad 2’s body, you can skin your case to match. This makes the look and feel consistent between your pair of devices. It also provides more scratch protection for the bottom of the case than than the included rubber feet. So, there are a lot of positives with the Logitech Keyboard Case. How about negatives? Frankly, there aren’t very many in my humble opinion, but here are a few things you should consider before taking the plunge. Chief on this list would be the size of the keyboard. While I have already covered this while talking about the keyboard’s performance, I just want to remind everyone that they need to consider what they prefer in a portable keyboard- small size, integrated design, and multiple uses, or a full-size keyboard that is bigger, but still acceptable for use on the go. In my opinion, the only real competition for the Logitech Keyboard Case is the Apple Bluetooth Keyboard, paired with the Incase Origami Workstation. It is a full size, but still fairly lightweight and mobile keyboard. However, it isn’t nearly as light and portable as the Keyboard Case, and the Origami case only holds the Apple Bluetooth Keyboard while on the go, so you have more to carry. In other words, the size of the Keyboard Case isn’t really an issue, as much as something to consider in comparison with your typing style and personal preferences. The next item to keep in mind would be the price. $99 can seem a bit expensive for a Bluetooth keyboard, but from my time with the Logitech Keyboard Case, I can assure you that it is worth the price. Consider the fact that you won’t find any keyboards of any quality for under $50.00, but even most in this price range are going to pretty mediocre. If you do a little research and check customer reviews, it becomes pretty obvious that you get what you pay for when it comes to keyboards. 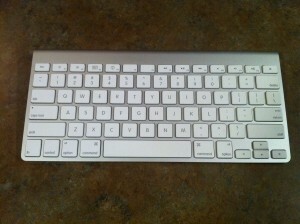 The Apple Bluetooth Keyboard is the highest quality alternative and is $30 cheaper at $69.99. However, that price only gets you the keyboard alone. You will have to come with your own dock and case, if necessary. The aforementioned Incase Origami Workstation takes care of both the dock and the case to go with your keyboard, but it costs and additional $29.99. 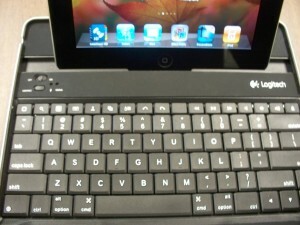 So, at the end of the day, the two best mobile keyboard setups for your iPad 2 come in at exactly the same price. The last major concern may not apply to every iPad 2 owner, but should be considered. 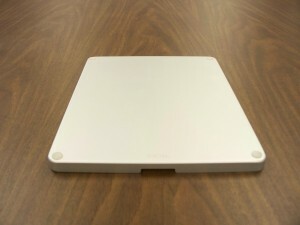 Apple’s Smart Cover is their flagship accessory for the iPad 2, and was introduced to great fanfare. All indications point to brisk sales of the flexible new covers since their introduction, as well. Due to the nature of its design, which predates the release of Apple’s Smart Covers, Logitech’s Keyboard Case is obviously not compatible with them. So, if you have already invested in a Smart Cover, then you should consider that you will have to remove it to use the Keyboard Case as a case. 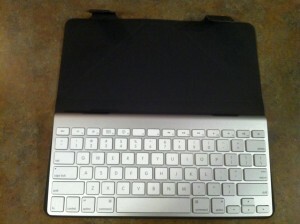 As far as keyboard usage goes, the Smart Cover can actually remain attached when using the iPad 2 without any issues. Despite the case incompatibility, you don’t necessarily have to dump your Smart Cover, altogether. While the Keyboard Case is designed to be used as a case, there is no reason that it has to be at all times, or at all, for that matter. It is so good as a keyboard with integrated stand, that the case is really more of a bonus, in my opinion. While I tested the Keyboard Case as a case for the purposes of this review, I have now gone back to my previous case and carry setup. Fortunately for me, the Keyboard Case is a perfect fit for the way I do things. In fact, it works a lot better for me than the Apple Bluetooth Keyboard and Origami Workstation did. I have always carried my iPad around from place to place in a 10″ netbook case, as it provides extra protection while traveling, as well as a zippered pocket for a charger and other small accessories. I have also added the a blue polyurethane Smart Cover to my arsenal this year with the iPad 2, which gives me some additional screen protection above what I already get from my full body skin. Even though the Logitech Keyboard Case won’t hold the iPad 2 face down with a Smart Cover attached, it works just fine the other way around. While the Keyboard Case isn’t designed to grip the iPad 2 from the bottom, the pair do stack quite nicely this way, making them a perfect fit together inside my netbook case. So, even if you already have a Smart Cover, I wouldn’t dismiss the Logitech Keyboard Case just for that reason. It’s just too good of a keyboard to do that. There really isn’t any mystery here. While there are a few things to consider before deciding whether or not this is the right device for you, rest assured that the Logitech Keyboard Case is definitely worth the price of admission. While it has many differences from its main competitor, the Apple Bluetooth Keyboard, it is every bit its equal. To be honest, after spending over a week now with the Keyboard Case, I have hardly touched my Apple keyboard. In fact, if forced to choose one, I would have to go with the Logitech at this point. The equal quality, integrated form factor, and portability are a killer combination for me. If you need a Bluetooth keyboard for your iPad, and you are comfortable with a keyboard with netbook-sized keys, then look no further than the Logitech Keyboard Case. You will not be disappointed. 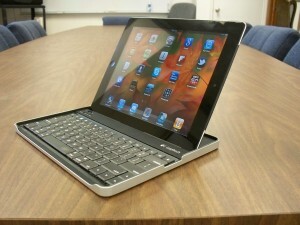 The Logitech Keyboard Case by Zagg for iPad 2 is available for $99. You can find more information on it here. 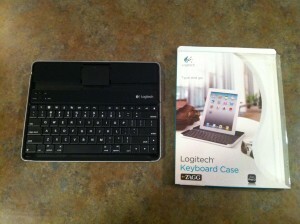 The Logitech Keyboard Case by Zagg for iPad 2 was provided by Zagg for review on iSource. For further information regarding our site’s review policies, please see the “About” page. Great analysis. I really love the ZAGG company products that I have purchased in the past and it’s great to hear they’re still making great products. Thank you very much for the kind words. . I would agree. Zagg is definitely known for their high quality products. I am looking forward to seeing some more iPad 2 accessories from them in the future. Great review. I am considering buying this keyboard and dropping the laptop altogether? As a person who writes every day, would you consider this as a good/feasible option? Funny you should mention this, because I am starting to work on an article that touches on this particular topic. That really depends on the user and their needs. It wouldn’t work for me all the time, but I am finding ways to do more and more of my common tasks with the iPad instead of my laptop. Stay tuned, and maybe some oft tips will help you. Now that’s what I call an interesting and comprehensive review! Thankyou for taking the time to review the product so thoroughly. I have the ZaggMate for the iPad. I love it and carry it every where. I slide it in my purse it protects my iPad from bumps. I do have my iPad invisible shielded (also by Zagg), but love the feeling of security with this rigid case. I feel the keyboard is a fine size, but i have a small laptop as well. My fingers seem to aways hit the intended key. Great review of a great product. Wonderful, very informative review. I’ve been doing a lot of research on the internet as to which keyboard to choose, and your analysis is the most helpful and complete. Thank you so much. I ended up going with the Logitech, not in small part to your review, and I am typing on it right now. I made the right choice, and I’m not sure I would have made it without your thorough and very useful information. Thank you so much for your very kind words. I am very glad that I could help you find a keyboard that you are happy with. It can be difficult to put $100 down on a device that you aren’t certain of. I know I struggle with that same issue, myself, so I am always glad when a review can help someone else out. I picked up a ZaggMate for iPad (original) at a yardsale this weekend for $15. 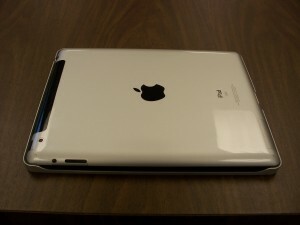 I was surprised to know my iPad2 will fit ‘facedown’ into the case, even with the smart cover on. It is NOT a snug fit. The only problem I had was with the angle of the display. I had been thinking the new Zagg case would probably be a better fit, but had been using a pen, folded napkin, etc., to prop the display more upright. I was DELIGHTED to see an image on your page with the display stand forming a triangle — didn’t know mine had that feature!!! Now, I can say I love this case, and I can say that the original case works well with the ipad2. Thanks for filling us in, Glenn. That’s a useful bit of info for Smart Cover users. There will probably be some good deals to be had. I’m glad to see that you found one. Thanks again. Hi..I have a zaggmate for the ipad2 and at first I was so eager to get my hands on it, because it looks nice and very compatible with the ipad2 but then when I finally got my hands on it and was playing with it and looking at the keys and then I realized that zaggmate doesnt provide you with a user guide at least to tell you what command key is for what..so I was just breaking my head trying to see how the arrow keys work,me thinking it would work on controlling the web pages up down..and Nooo doesnt work it only is good for the notes app but not for scrolling down or up on a page..the matter is that I was mostly using the touch screen then the keyboard..anyway I dont use it I rather use the ipad keyboard then this zaggmate..I need a bluetooth keyboard that Im not going to touch the ipad2 when using it.I want the keyboard to control it.. While I share your frustration with the lack of functionality in some areas, the issue you are speaking of isn’t specifically related to the ZaggMate or Logitech Bluetooth Keyboard. iOS currently lacks complete keyboard integration throughout the OS, so that is where the limitations come from. I am certainly hoping that Apple addresses this in iOS 5.We shall see. I happened to come across a Logitech Zagg cover for iPad2 at an unclaimed salvage and freight place for $69, new in the box. I’ve tried three other cases, this is BY FAR the best. (I wish I’d have saved my money on the other cases for more apps!) The Apple magnetic Smart Cover slips off at then worst times (like when I’m slipping it into the folder section of my laptop case, or when I’m slipping it into the pocket of the airline seat, or… Besides the obvious benefits of rugged protection, I find the arrow keys very, very useful (audio control keys are also very handy). The on-screen keyboard doesn’t feature these and I found myself frustrated when typing wanting to “arrow-forward” a couple of spaces after a delete sequence (the magnifying bubble for cursor placement works, but is a hassle.) This keyboard gives that functionality and a lot more, like shift-arrow for text selection and CMD-X,C,V for cut, copy, paste. Very useful. The very best accessory in my opinion. By the way, the Zagg cover has a magnet in it to shut off the iPad2 just like the smart cover…but it has to be placed face down. An informative review, but wordy. It could be cut in half and still convey the same information and assessment. Great review, thanks for taking the time to do it. I have read a couple reviews elsewhere that suggest that because of the Bluetooth nature of the pairing, this keyboard can’t be used on an airplane. That doesn’t seem correct to me. Am I crazy? Unfortunately, that does away with pretty much all options for external keyboards. You may have a couple of options, however. 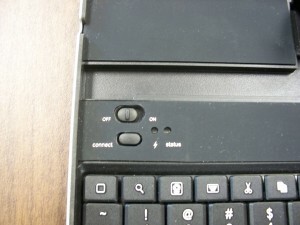 First, the original Apple iPad Keyboard was a dock keyboard that used the port for integration. Unfortunately, it isn’t the most portable device, and it only works in portrait mode. Although, I do think there were some dock port to dock port cables and hack instructions to make it work in landscape. I have never tried it myself. Your other option is a bit more jurryrigged, but it might work. If you get the iPad Camera Connection Kit, it has a dock port to USB connector. Early reports revealed that this would allow integration with USB keyboards. Unfortunately, Apple killed that in one of the iOS 4 updates by lowering the voltage that the port allows, making it only work with devices that have their own independent power, like cameras, If you can find a small USB keyboard that has its own batteries, which may be difficult to find or completely non-existent, it should still work with the connector. If you find one, a portable iPad stand or a Smart Cover should handle the rest. Please let us know if you find a compelling solution. I’d love to hear about it. My wife hates the Zaggmate because it’s not a soft case. There are times when holding a cold piece of aircraft aluminum just isn’t comfy, for example when reading an eBook. 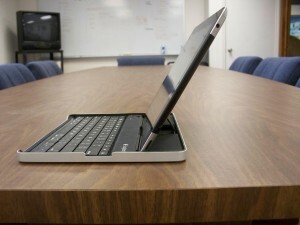 I wish we could retrofit the combo with a soft plastic or leather skin that would match the iPad2. Cheers to all! I am fully blissful after I saw the weblogblog site! Thanks for the review. I had already purchased this case before reading your review. I wanted a keyboard that would hold the ipad both portrait and landscape and so it became this one. It _is_ expensive (99 EURO I paid in the Netherlands (apple premium reseller), but that was my own decision. Anyways, what I wanted to remark was that my case has its logo and the buttons mirrored compared to what the pictures show. Also, it no longer has the ‘triangular stand’ as shown here. 2. It IS stupid, I already have a built in keyboard on my ipad, unless you want use your ipad as a laptop(witch I would not recommend) I’ve never had a problem with my other keyboard, and 99dollars for a useless little keyboard, really? I dont even like typing on it. If you still want to buy it, think, do I really need this? I know for some people this could be quite useful! but if you want to get it for a high school student, dont. Most of us just use our ipad for fun, we perfer doing our homework on actual computers. And please dont call me spoiled brat, I am simply just not very happy with my christmas present. I bought this based on your excellent review. Sadly, although it connected initially to my Ipad, after the first use, it no longer connects, no matter what I do. I’m unimpressed. Sorry to hear that, sbird. I have owned several different ZAGG Bluetooth keyboards, including both versions of the Logitech Bluetooth Keyboard Case and the ZAGGfolio. I have never had any connections issues with any of them. I have heard of a couple here and there from commenters here and from others, but nothing widespread. Any manufacturer is going to have a few bad apples. I would definitely recommend you return it to the retailer or to ZAGG for a replacement. I think it would be unlikely that you would get two bad ones in a row. I had a similar issue. A friend was over playing with my iPad, and insisted on turning off the keyboard “to save the battery, since it has such a short life”. The keyboard did not auto-connect upon turning it on. Go into Settings -> General -> Bluetooth. It may say “On”, but I found I needed to click on Bluetooth, and then click on the line that says “Logitech Keyboard Case” in order to get the keyboard to connect/work. Also, like Jorn, my new keyboard has the logo and buttons reversed, and no triangel thing. I purchased mine from Zagg on Amazon just a couple weeks ago. Also, my status light is green not blue. There has actually been a complete re-design of this keyboard. It is now the same layout with spaces keys as the ZAGGKEYsolo and ZAGGfolio keyboards. Logitech evidently requested this of ZAGG after seein those designs. I am looking for a keyboard that will connect to my ipad2 without a wireless connection. For example, when I’m on an airplane. So… will this one do it? If not, which keyboards will? The only one I can think of off the top of my head is Apple’s original iPad Keyboard, which works off the dock connector. It isn’t the best or most portable option, but it does work without Bluetooth. Taking mine back tomorrow. Holds & protects the iPad well enough & keyboard works fine. I had a $30 screen applied to my new iPad for another $15 at Best Buy, only to find that the rubber bar on this keyboard case that’s supposed to protect the iPad screen leaves an indelible, unremovable mark all the way across the screen. Now have to get a new protective screen and get rid of what otherwise is a good keyboard case. Too bad Zagg. Sorry to hear that Mr Bowman. I have a screen protector, as well, but haven’t had that particular issue. I do have marks from the two rubber feet, but fortunately those are on the bezel, and not the screen. If you like the keyboard, the redesigned Logitech Bluetooth has the same design, but shouldn’t cause problems with your screen protector. I LOVE this keyboard, but started noticing scratches on my screen. Fortunately, I have a screen protector, which I had replaced under warranty. So with a FRESH screen protector installed, I put my ipad in the Zagg case, and when I took it out I confirmed that it was indeed the ZAGG Keyboard itself that was producing the scratches upon my screen protector. Bummer… I can be more careful about how I take the ipad out of the case now, but it really is a design flaw of the ZAGG keyboard case. I checked with them on this a few weeks ago. 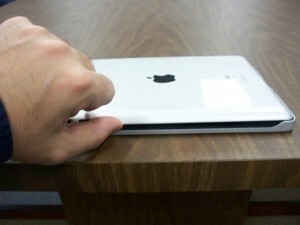 It is just a little bit deeper to account for the thicker back of the New iPad. That’s the only difference. This is by far the best logiteck bluetooth keyboard for ipad. I haven’t bought this keyboard yet. But I definitely will give it a shot. Thank you for this detailed review. Could you kindly address the battery issue? Is it true that it cannot be replaced and that you will have to purchase a whole new keyboard/case, when the battery eventually dies? Thank you! Theoretically, yes you are correct. However, I think I have charged mine three times in over a year of use (sporadic use over the last few months, as I have been using two or three others). The battery will likely last for several years of normal use before it discharges to a point where it is no longer works. In other words, you will probably have moved on to something else by then.